"Imax reserving all of its screens for a single movie for a month is not unprecedented, but it is unusual. The company had a similar deal for the three Hobbit movies, but it struck that pact four years ago and hasn't made that type of commitment since. In June, Imax broke its own opening-weekend record when Jurassic World leapfrogged over Iron Man 3's $28.8 million to grab $44.2 million worldwide — $21 million from 363 domestic screens and $23.2 million from 443 screens abroad." In addition to be released in IMAX, The Force Awakens does feature one sequence shot using IMAX cameras. Director JJ Abrams is a fan of the format and had previously used IMAX cameras on Star Trek Into Darkness. The sequence in question will include the shot of the Millennium Falcon flying over the desert plains of Jakku from the first teaser (a still from that sequence was released in IMAX aspect ratio back in November). Eagle eyed viewers of the San Diego Comic Con reel will have also noticed that IMAX cameras can be seen in the Falcon's cockpit when Daisy Ridley is at the helm, so it seems safe to assume that Rey will be piloting the Falcon in this sequence. 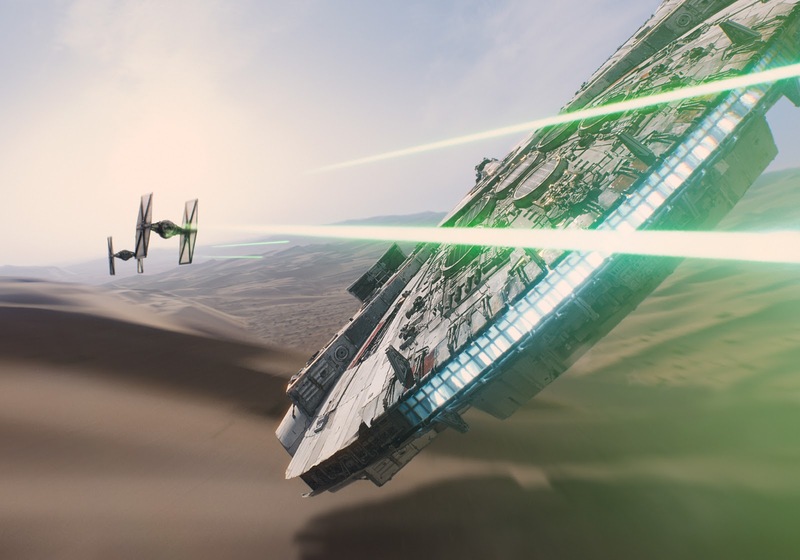 Do you plan on seeing The Force Awakens in IMAX? Let us know in the comments! I hope it'll also be on regular screens. Imax causes issues for some including myself. I'd love to see it, but I'm not going to pay to see it when I know I can't enjoy it. Why can't I like, comment or post on the Facebook page of the star wars underworld?